A quick way to force-quit apps and processes. Is there a better alternative to QaLL? 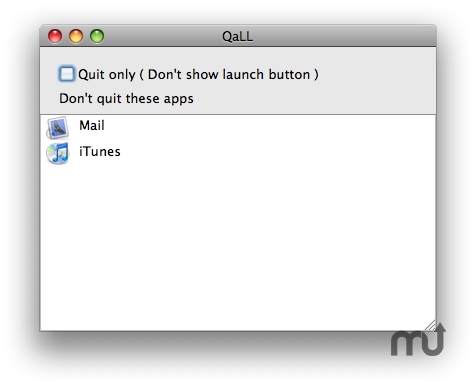 Is QaLL really the best app in Desktop category? Will QaLL work good on macOS 10.13.4? QaLL terminates every running applications at once. With the touch of a button, it will also relaunch all applications that have been terminated by QaLL. Of course, you can specify apps that you don't want to terminate. QaLL needs a rating. Be the first to rate this app and get the discussion started! Mac OS X is able to run many apps in parallel, but sometimes especially when you play a game or run a big application the processing speed can be slowed down by of other open apps. So, you can use QaLL to close down needless processes and therefore feel comfortable running big apps. After you quit the big application, you can launch all the smaller apps again by clicking a single button, and quickly and easily get back to your work again.